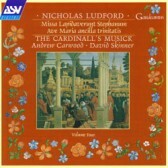 This disc represents the last in the series devoted to the works of Nicholas Ludford. His setting of the Missa Lapidaverunt Stephanum uses a melody from the Feast of S. Stephen and this may be particularly important in Ludford’s life as he held the post of ‘verger’ at the Royal Chapel of S. Stephen in Westminster. Scored for five voices, it is a euphonious and gentle setting. Ave Maria ancilla Trinitatis sets a florid pre-Reformation text in honour of the Virgin Mary.